With Cheryl Mathieu, Ph.D., M.S.W., M.S.S. Dr. Cheryl Mathieu, Winner of Oprah (O) magazine - The White House Project Leadership Project, has demonstrated time and time again the ability to manifest her dreams. At a young age, she first demonstrated her determination and tenacity by excelling in sports. At age 15 and 16 she was the top female racquetball player in Missouri, and at age 17 she was second in the nation in juniors. Cheryl also was a state champion in softball in her teens and was awarded a softball scholarship to college, playing catcher. She moved from the Midwest to Los Angeles at age 20, and had a vision to live rent-free on the beach. Everyone she talked to (who wished for the same thing) told her it couldn’t be done. Within months, she manifested her dream, and lived for four years in a guesthouse, rent free, on the beach in Marina Del Rey. She returned to college at age 30, and took the next nine years to get her bachelors, master, and doctoral degrees in social work. She’s started her own geriatric care management business and launched AgingPro.com, a national online eldercare resource while simultaneously juggling the responsibilities of being a new mother. These are just a few examples of how Cheryl has manifested her dreams. What dreams do you have that you’d like to create? In what areas would you like more expression? How are you rising to the occasion of growing older? 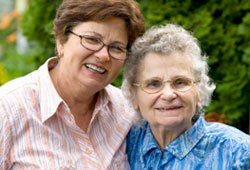 Are you overwhelmed by the demands of caregiving? Do you have as much fun and joy in your life as you’d like? with you, or your loved ones, growing older? Are you looking to inject greater purpose or meaning into your life? Do you want to act or respond differently? Are you interested in designing and creating the next chapter in your life? Do you want to leave a legacy for your family and community? Would you like to find out what excites you about getting up in the morning? Stop struggling alone. Having Dr. Cheryl as your coach will change your life! Coaching typically begins with an intensive two-hour in-person or phone session, with ongoing support through 30-minute weekly phone sessions. What holds you back from having what you want? What moves you towards what you want? What type of relationship do you want with your loved ones? You have all the answers inside. Learn how to access your wisdom. Create what your heart dreams of! "Whatever you can do or dream you can, begin it. Boldness has genius, power and magic in it. Begin it now."